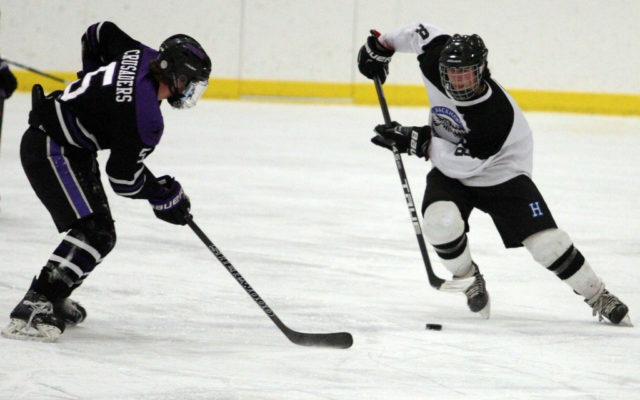 The Houlton-Hodgdon-Southern Aroostook-Katahdin Black Hawk hockey team split games over the weekend, falling 5-1 to John Bapst Friday evening, but rebounding to a 9-1 victory over Messalonskee Saturday. HOULTON, Maine — The Houlton-Hodgdon-Southern Aroostook-Katahdin Black Hawk hockey team split games over the weekend, falling 5-1 to John Bapst Friday evening, but rebounding to a 9-1 victory over Messalonskee Saturday. The Black Hawks are now 3-11-1 on the season and ranked eighth out of nine teams in the Class B standings. Only the top six teams qualify for the postseason so the squad will have to pick up a couple of key wins in the final weeks of the season to keep their playoff hopes alive. The team has three games remaining on its schedule — hosting Presque Isle (12-3) Thursday Feb. 14, at 6 p.m.; at Maranacook (1-12) Tuesday, Feb. 19; and at Camden Hills (8-7) Wednesday, Feb. 20. Against John Bapst Friday evening, the Black Hawks’ lone goal came from Jason Collett with an assist from Noah Reynolds. Elijah Matheson made 29 saves on 34 shots for the Black Hawks. On Saturday, the team travelled to Oakland to take on Messalonskee and skated away with a 9-1 victory. Individual results from that game were not available.